Taking a retrospective look at Judy Garland’s performances in ‘The Wizard of Oz’ (1939) and ‘A Star is Born’ (1954) leads to oneself questioning whether or not Judy was projecting a portrait of herself through the characters she played. Many have investigated whether her persona is attuned to the moral and ideological interpretations of each film and people have considered how Judy’s performances paralleled to her private life. I have delved into the world of classical Hollywood in an attempt to come to terms with who Judy was when she performed. At sixteen Judy Garland became a Hollywood star in her debut ‘The Wizard of Oz’ (1939). Despite the film being badly received upon release it became and remains one of the greatest of all time. The audience meet a twelve year old girl, Dorothy Gale, whose desire it is to find a place far, far away “where troubles melt like lemon drops”. A tornado whisks her house off the ground transporting her out of the dull, sepia toned Kansas to the beautiful but dangerous Technicolor world of Oz. Dorothy accidently lands on the wicked witch who has taken rule over Munchkinland. She is threatened by the Wicked Witch of the West, but the Good Witch of the North gives her the red ruby slippers for protection. Her desire to return home to Kansas can only be realised by The Great Wizard of Oz. From that moment Dorothy has to take a journey along the yellow brick road. This journey symbolises the progression from adolescence to adulthood, from dependency to autonomy. Initially Dorothy is desperate to leave her ordinary life in Kansas and dreams of reaching ‘Somewhere over the Rainbow’ but when she arrives in Oz all she wants to do is go home. The film’s ideology focuses on family unity and the love it brings to Dorothy’s life. 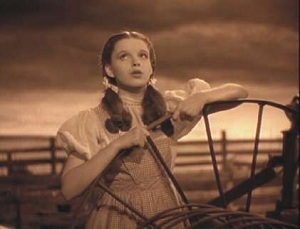 Dorothy learns a vital lesson at the end of the film; “If I ever go looking for my heart’s desire again, I won’t look further than my own backyard”. The film studio MGM wanted Judy to fit into a role, a persona that they could replicate, after all Judy was not the average Hollywood star; her astonishing voice juxtaposed her youthful exterior – she was unique and certainly going to make MGM a lot of money. During this period of film production, the star became the property of the studio; they looked after that star, but also took advantage of what benefits they were reaping from their product. MGM felt it was necessary to ‘fix’ her appearance as they originally put her in a blonde wig; but shortly into filming producers Arthur Freed and Mervyn LeRoy decided against this. Judy became ‘the girl next door’ and would fill this role in several more MGM productions. However, she continued to endure manipulation; her breasts were bound with tape and she was made to wear a special corset to flatten out her curves and make her appear younger. MGM made extreme efforts to conceal Judy’s curvaceous figure and make her look as ordinary as possible, if she wasn’t going to fit the typical blonde haired Hollywood star she could only look like a youthful, naive young girl. The attention she gained by audiences was unavoidable – her voice was what so many people loved Judy for, even Shirley Temple, who was a very big child star of that time was turned away for the part of Dorothy. Judy was not pushed into the background in ‘The Wizard of Oz’; there were several techniques used to construct her stardom. The main way to make Judy stand out was through the use of Technicolor. As illustrated you can see the difference between Kansas and Oz; The sepia tone of Kansas expresses that it is not a place full of excitement or life. The colour also parallels to the ordinary persona of the girl next door that MGM wanted Judy to fill. In Oz she is the one that stands out with great vibrancy and energy. Her red lips, ruby red slippers, blue and white dress and neatly tied pigtails are what makes Dorothy Gale such an iconic character, because they are so full of colour the audience cannot take their focus of Judy Garland. 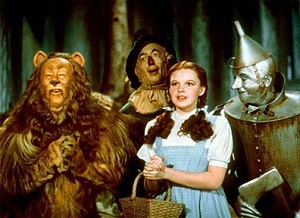 In the snapshot of Lion, Scarecrow, Dorothy and Tinman it is Judy who stands out. As well as using colour to construct Judy’s stardom, the use of framing and editing places Judy central to most scenes, the audience automatically see her as the dominant character because of her physical position; this is justified as she is the protagonist. Ultimately what made her a star in her debut film was her voice: it was this voice that astonished everyone because it didn’t match with Judy’s childish, naive persona – this was something MGM wanted to keep a tight hold of as Judy’s success would be a goldmine for the studio. The ideological message behind ‘The Wizard of Oz’ is that ‘there’s no place like home’. The audience see Dorothy realise what her family and home mean to her. Retrospectively the love for a family Judy portrays as Dorothy is ironic considering Judy’s own abusive childhood and governing upbringing from her mother. There’s a part in the film where Dorothy is trapped in a tower by The Wicked Witch of the West, once the witch has left the room, her glass ball is filled with the face of Auntie Em and Dorothy can see that her Auntie is desperately looking for her. MGM consciously decided to give Dorothy an auntie and uncle rather than a mother and father highlighting their low opinion of her parents and their treatment of Judy. Because her acting career was so demanding she was put onto uppers and downers to keep her awake during the shoots and to help her sleep at night. The song ‘Over the Rainbow’ could be read retrospectively as Garland yearning to escape the pressurised culture she was brought up in. Her child-like persona makes her vulnerable and the audience sympathize with her. While Judy sings this classic number an overwhelming emotion spills out onto the audience. The slightly depressing thought whilst watching this performance is thinking how Judy, as much as the character Dorothy, wanted to sometimes just escape her reality. Watching it now audiences are more aware of her private life and what difficulties she endured. The girl lost in Oz was in fact Judy. In 1950 MGM ended Garland’s contract due to her suicide attempt, she was too unstable to continue acting. After 1950 audiences no longer saw her as the ordinary girl she appeared to be. Her ‘uncomplicated and ordinary MGM image’ had abruptly altered and her films were re-interpreted. Intriguingly in a ‘A Star is Born’ (1954) Judy plays the character Esther Bloggett, who witnesses the downfall of her husband, Norman Maine, who ends his life by committing suicide. ‘A Star is Born’ stands off when Norman Maine, a movie star whose career is on the decline, meets showgirl Esther Blodgett when he drunkenly stumbles into her act one night. A friendship develops and later blossoms into romance. Emotional tension increases when Esther’s career takes off while Norman’s continues to plummet. The audience witness Esther’s progression to stardom, which is reminiscent of Judy’s. Many of the lyrics represent incidents in her life and the film explores the reality and struggle of her career. The song ‘I was Born in a Trunk’ directly reports her life to both the audience in and outside the film. The lyrics are intrinsically narrating Judy’s own life; ‘If you knew of all the years of hopes, dreams and tears, you’ll know it didn’t happen overnight’. They also highlight the struggles that she had; ‘grew up in a crazy world’, of ‘sleepless nights and endless nights’. The audience do not feel a great sorrow for Judy at this stage because her performance is powerful; she is not complaining but reporting how she managed to get through her struggles. She makes it clear that showbiz is hard and ‘no matter what the show must go on’. The film’s ideology is similar to ‘The Wizard of Oz’ Garland wants to make her dreams come true and reach ‘Over the Rainbow’ again. The theme of love and unity presents Judy’s character with an opportunity to take an adventure. This time it is not into a fantasy world but the hard world of Hollywood and she is choosing to take an adventure with an unstable alcoholic. Judy is under far more scrutiny in this film because of the context surrounding it; the audience were aware of her suicide attempt and her drug addictions, with this in mind those who were fans of Judy Garland would not criticise her performance for being neurotic or shaky. Whether you are a fan or not retrospectively more focus is given to Judy Garland’s performance and her persona. There is a scene where the make-up artist says ‘The nose is the problem’. During the classical Hollywood period of cinema studios had a certain criteria that a female star had to follow: you could only be a star if you were blonde, beautiful and feminine. In ‘A Star is Born’ Judy is put in a blonde wig, smothered in red lip stick and coated in make-up. This shows that Judy clearly doesn’t ‘fit’ into this persona. Norman Maine expresses the audience’s view by laughing at her and affectionately telling her to take it off. He tells her that she’s beautiful the way she was before. The film shows that the physical manipulation of Garland’s appearance was ridiculous and unnecessary. While the film explores female insecurities the audience feel as though they are watching Judy Garland instead of Vicki Lester. Another classic number ‘The Man that Got Away’ is the song Norman overhears and becomes fixated with. It is performed privately in a closed bar with Esther and her band. Judy Garland’s casual persona expresses her natural talent. Her voice makes her appear powerful and you can feel the pleasure and enjoyment both the character and Garland have from this performance. This is not attuned to the contemporary view that Judy became neurotic and unstable during her performances. Here she appears confident and comfortable when singing. 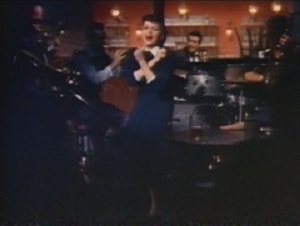 ‘A Star is Born’ was a Cinemascope production, and its use of widescreen made Judy Garland a prominent figure in every shot. 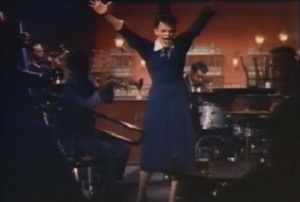 The framing in the performance of ‘The Man that Got Away’ highlights Judy as the main star in the film as she takes central position in the frame as illustrated above. The lighting emphasises Garland’s position and forms shadows over the band members. The use of widescreen means they are pushed to the edge of the frame making them less important, the audience can then focus on Judy. Richard Dyer suggests her performance had ‘signs (not hard to find) of…neurosis’. He felt she showed anxiety, depression and hypochondria. My perceptive is more sympathetic towards Judy Garland’s performance as these snapshots from the film clearly demonstrate her gestures are powerful and controlled. She displays her acting ability as the movements she makes are appropriate to the film’s narrative. Richard Dyer also felt she had a ‘lack of control’. Despite being aware of her external image I still felt that her performance was outstanding considering what she had been through up until then. The claim made by Dyer and McLean that ‘Garland’s star image would probably still have been labelled neurotic by 1954’ in some ways is unfair. In the film Vicki Lester is neurotic after her alcoholic husband Norman starts to self destruct meaning her gestures are not, as Dyer puts it, ‘unpremeditated’ they are appropriate for the storyline. One would probably become neurotic if a loved one became ill as Norman Maine does. ‘A Star is Born’ supports Judy and makes you see her as a star. In the film she nearly gives up on her career but the audience witness her fighting back, showing to the world that she is strong, just as Judy Garland did. 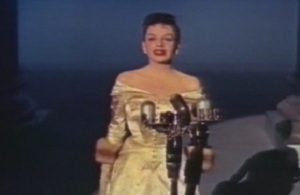 In the final scene, shown below, the audience are told that the ceremony is being broadcast all over the world emphasising how famous she has become. Her stage persona ‘Vicki Lester’ is given the introduction; ‘A star that shines bright and high’. At the end of the film Vicki Lester is a symbol of strength that has battled through a difficult life and career. Garland’s persona and performance is certainly attuned to the varying interpretations of each film. One could disagree with Dyer and McLean’s interpretation that in ‘A Star is Born’ Garland is neurotic. Her gestures seem to be justified in relation to the plot and her performance only becomes neurotic at appropriate moments of despair. I do not think Judy Garland necessarily expresses an inability to cope, however, her screen persona, Vicki Lester, becomes depressive at key moments of personal difficulty in the film due to Norman’s alcoholism. She becomes hysterical during such scenes, which could be the true personality of Judy coming through or just good acting. Retrospectively when Vicki Lester utters the phrase; ‘I hate me’ the audience probably read it as Garland’s own view of herself. To some extent Dyer and McLean are correct as Vicki Lester’s mood swings could be Judy’s. She rapidly goes from being happy to being depressed on several occasions during the film. However, her character is not the one who self destructs, her husband Norman Maine is. She rescues him after he is arrested; he then decides to commit suicide by drowning himself in the sea to allow her career to continue. The film holds a huge amount of melancholy especially in retrospect of Garland’s own ending. Garland’s persona and performance have come under tight scrutiny post 1950 up until her death in 1969. Her films were re-interpreted to take incidents of her private life into consideration and look at whether they affected her performances. I have touched upon the fact that many factors assisted in the construction of Judy’s stardom but ultimately her voice and the pleasure expressed in performing was what allowed her status as a Hollywood phenomenon to live on. Being part of a retrospective audience for both films I take the external factors into consideration and see Judy Garland’s persona develop from an innocent yet mature child to a woman whose performance is made up of strength and warmth despite her difficult private life.